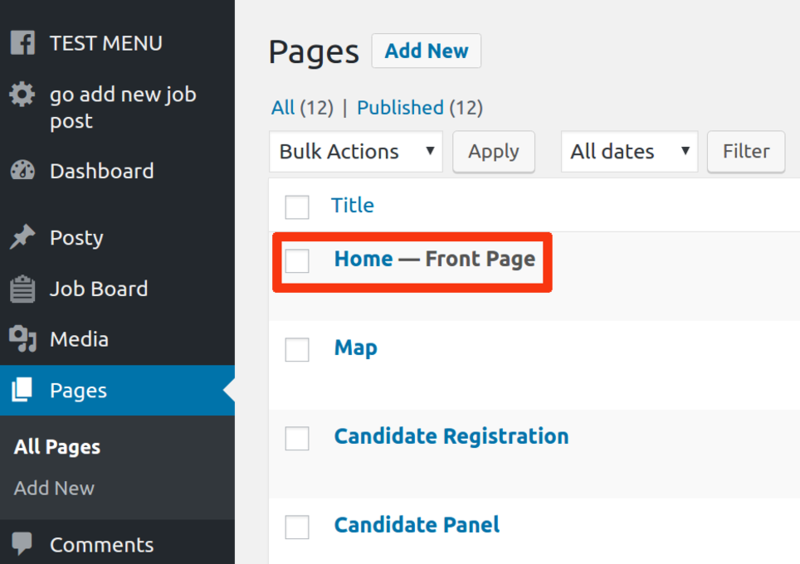 WPJobBoard Pages are embedded into normal WordPress Pages, in order to put job board on the home page, you just need to configure WP to display static Page on home. There are two ways to do it. First, you must find your home page, you can find it in wp-admin / Pages and find “Front Page” and click on it. Note that if you cannot find a page with postfix “Front Page” in your pages list then most likely your website is not using any of the Pages as a home page in this case you can setup a home page from wp-admin / Settings / Reading panel or go directly to method #2 in this article. Next, when you click on this page, you must paste this shortcode [wpjb_jobs_list] in the home page content. The second option how you can put job board on the home page is to add function wpjb_jobs_list() to code your theme file ‘index.php‘. Note that this file might not be serving your website home page this varies from theme to theme in this case you might need to contact your theme author and ask how to display a shortcode on home page. For some reason the homepage is not auto updated. Please note that currently this article is a bit outdated, right now it is best to use [wpjb_jobs_list] shortcode https://wpjobboard.net/kb/shortcode_wpjb_jobs_list/ in order to display jobs list on home page.